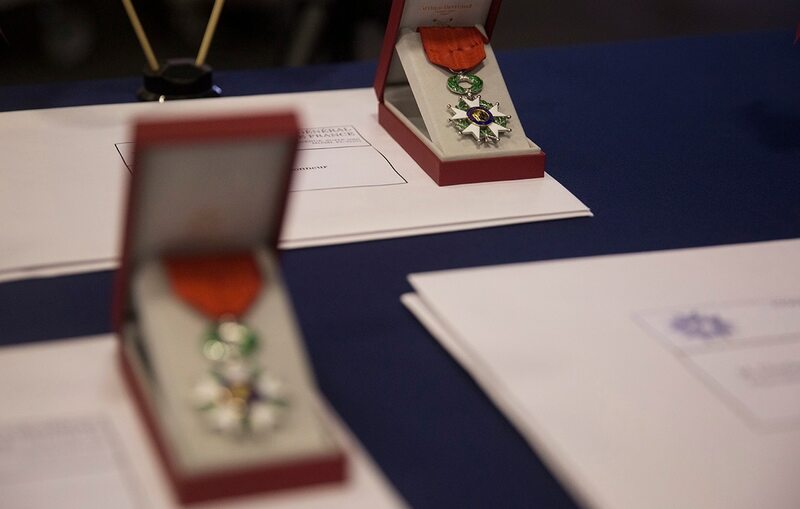 ST. LOUIS — Three St. Louis-area World War II veterans in their 90s who played roles in liberating France from Nazi occupation have been given France’s Legion of Honor. The St. Louis Post-Dispatch reports that a ceremony on Wednesday at Soldiers Memorial in downtown St. Louis honored 95-year-old Alfred Villagran of Chesterfield, 98-year-old Eugene Harmack of Kirkwood and 98-year-old Glenn Harrison of O’Fallon. The honor was started in 1802 by Napoleon Bonaparte and past recipients have included President Dwight D. Eisenhower, Gen. Douglas MacArthur and St. Louis aviator Charles Lindbergh. Guillaume Lacroix, consul general of France for the Midwest, told about 200 friends and relatives who attended the event that without Americans like Villagran, Harmack and Harrison, the French flag "would not be flying here today." As Lacroix pinned his country's most distinguished medal to Villagran's chest, Villagran thought of the five men in his B-17 bomber crew who were killed in combat. Harmack was a communications operator in the 329th Infantry Regiment HQ Company, 83rd Division, when he fought in northern France and Central Europe. He once secured a vehicle trapped behind enemy lines and used the radio inside to re-establish communications with Allied forces, earning the Bronze Star. He was 24 when he fought in the Battle of the Bulge in the Ardennes forest in Belgium. The battle, fought in below-zero cold, was the largest single one on the Western front, resulting in the deaths of nearly 20,000 American soldiers. Harmack, who turns 99 on Feb. 2, called the medal "a great honor. I'm very proud." Harrison was 23 when he was a pilot on a B-17 plane that flew 17 missions and was shot down twice. Once, his crew survived by bailing into the English Channel. The second time, the plane was shot down as it flew toward Munich. The crash killed some members of the crew. Harrison survived but was taken prisoner and forced to march 300 miles into Nazi territory. He was held from June 1944 to January 1945. “I’m very honored,” said Harrison, who will turn 99 in March.